Bumblebees and Butterflies: My little work of art. My little work of art. It's the weekend, another week gone and a whole week since I started the blog. My son Ben is in Newquay with a group of friends on Matt's stag weekend and they have just come out of the sea having had a surfing lesson. Apparently it was warmer in the water than out, but a great time had by all. The card I am posting today has taken me all week to finish, admittedly I have been doing other things in-between, but it has taken a great deal of thinking time as well as time given to the details. I am really quite pleased with it now that it's completed. I guess this type of card will have a name, but I needed a way of making the card larger than a straight A4 piece of card would allow for and this is what I came up with. I took time to decorate the inside as well. 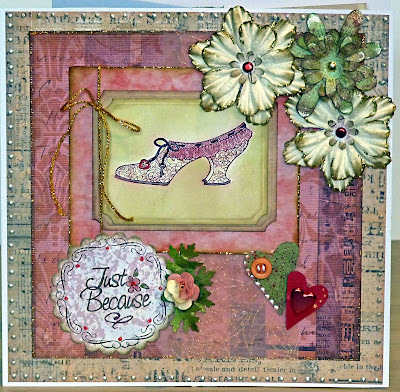 I used a stamp I already had and having inked it up I then masked it to complete the distressed background. 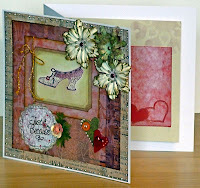 I have used the Nestabilities for the message (Justrite Stampers) and the mount for the stamped image. The papers are from sets I have already bought and from a CD by Papercraft World. On the creamy flowers I have used gold Stickles and Adirondack Espresso, the smaller centres I made and then put it all together with a red brad. The green flower I made using flower shapes cut on the Cricut, distressing with the Espresso and misting with Cosmic Shimmer Mist, Lava Red. The leaves have been punched and misted with Golden Mint Cosmic Shimmer Mist. The hearts were cut on the Cricut and I used Aqua Cosmic Twinkles and Baby Pink Pearlidoodle. I used silver liquid pearls round the edge of the paper. 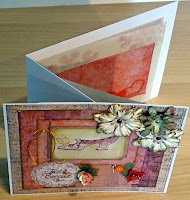 I really enjoyed making and putting this card together and feel that it truly is a piece of art.